According to the Odd News from Reuters, "a Chinese city has beaten the Grinch at his own game, banning Christmas trees from shopping malls, restaurants and other public places because they pose a fire hazard, a newspaper reported on Thursday. Chen Ying, deputy mayor of Zhuhai, a city of 1.3 million people in southern China, said restaurants, malls, grocery stores and other entertainment venues had to remove trees and other 'flammable decorations' immediately. 'Those that fail to rectify the situation will be subject to legal measures like suspension or closure, the Southern Metropolis Daily quoted Chen as saying on Wednesday." 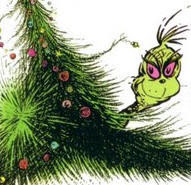 Disclosure: I am Mrs. Grinch by my own merits, not related in any way with Mr. Ying, who is apparently from the oriental branch of the Grinch family.